The Nationals weren’t content with their 3-3 jaunt through Florida and Chicago, said Jim Riggleman after tonight’s contest. It showed in their performance tonight against the struggling Braves. But, as with many things the Nationals do, it was subject to some initial difficulties. 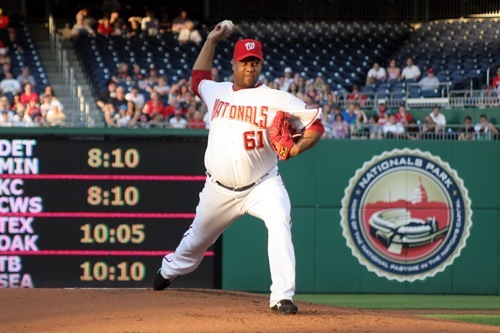 Livan Hernandez, on the mound defending his NL-leading ERA, had a rough first inning, throwing 41 pitches and giving up an unearned run. He did, however, pull it together and throw 5 1/3 innings of 2-run ball, and hung on through 123 pitches to pick up his fourth win. The Nats’ bats woke up tonight, striking for 3 home runs including a monster shot by Adam Dunn into the upper deck of right field. Willingham went deep in the second, followed by Ian Desmond walloping a ball to left center in the fifth before Dunn would crush his upper deck shot in the sixth. The Braves, excepting Justin Heyward, who sent the ball as deep into center field as this reporter has ever seen, were struggling at the plate despite all of the opportunities they were given by Livo. Good defense by the Nats kept the Braves out of this game, and the bullpen combo of Burnett, Clippard and Capps were able to shut the Braves down. Capps came in with one out in the ninth, after Batista allowed a run and created a save situation, and got Troy Glaus to ground into a game-ending double play. 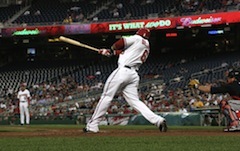 As much as they struggled last night to complete the win, the Nationals didn’t seem to buckle under to the pressure. Last year’s team, seemingly incapable of heart and luck, would likely have floundered in the face of Livan’s 41-pitch first, or the errors by Desmond and Bernardina, but this year’s club continues to do more with what they’re given. Asked about it during the post game press conference, Riggleman said that the Nationals “won every game that they were in this season,” speaking strongly to their character and the leadership of the veterans. Riggleman was quick to give praise to Livan for muscling through a tough outing, and also to rookie Ian Desmond for this efforts both at the plate and out at short. Tonight, Luis Atilano goes for his third win in as many starts as the Braves series continues. Keep kicking those Bravos while they’re down!